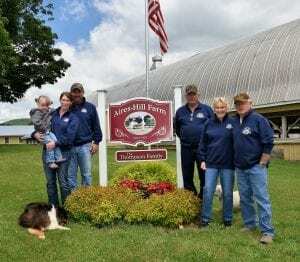 Aires Hill Farm, a 400-head Holstein operation in Berkshire, has been named the Vermont Dairy Farm of the Year for 2018. Karie Thompson Atherton is the primary manager and part-owner, responsible for all the decision-making in the daily operation of the farm. She took over in 2014 when her father Edward Orlyn Thompson and uncle James Bryan (Bernie) Thompson decided to retire. She currently milks 195 cows twice a day in a double-ten parallel milking parlor. The average daily milk production is 77 pounds per cow with 3.5 percent butterfat and 3 percent protein. The farm has been with St. Albans Cooperative Creamery since 1986, consistently earning awards for its high-quality milk. In 2016 Atherton received an award from the co-op for Platinum Quality milk and for having two perfect inspection scores of 100. Aires Hill Farm grows all its own forages, supplementing the cows’ diet with purchased grain. The 250 acres of grass yields an average of 4 to 6 tons of dry matter per acre with the 130 acres of corn yielding 18 to 19 tons of silage per acre. Cows are fed a 60 to 40 forage-to-concentrate ratio of TMR (total mixed ration) along with bypass fat to help improve body condition. The farm uses rotational grazing for dry cows to help reduce feeding costs. That the dairy farm is a good steward of the land is evident by its conservation practices, many including use of buffers, blocking access of cattle to streams and developing a nutrient management plan were implemented before the Vermont Agency of Agriculture, Food and Markets made these required agricultural practices. Winter rye is used as a cover crop on 100 percent of the cropland. Earlier this year Aires Hill received a matching $40,000 grant from the Vermont Housing and Conservation Board to purchase rumination collars to help monitor the cows’ activity, which alert the farmer to cows in heat or requiring attention. The grant also covers installation of a cow identification system in the milking parlor. Atherton is a former 4-H’er and is active in the St. Albans Co-op Young Cooperators. She also works with the Cold Hollow Career Center in Enosburg Falls, offering students an opportunity to work on the farm to learn about dairying to determine if it is the right career choice for them. The Vermont Dairy Farm of the Year award is presented annually by University of Vermont Extension and the Vermont Dairy Industry Association to an outstanding dairy farm. The winner is honored at an awards banquet at Eastern States Exposition in West Springfield, Massachusetts, in September, along with winners from the other New England states, and at the Vermont Farm Show in January.